We made the decision earlier this year to send Milo to his first away camp this summer. 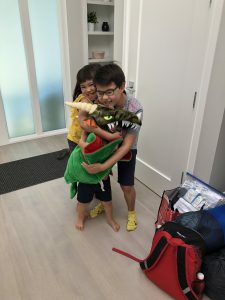 We never really planned for an age when he should be doing a going away camp until we were introduced to the Enchanted Hills Camp (EHC) last year. Milo was a little apprehensive about going but we really didn’t give him a choice. 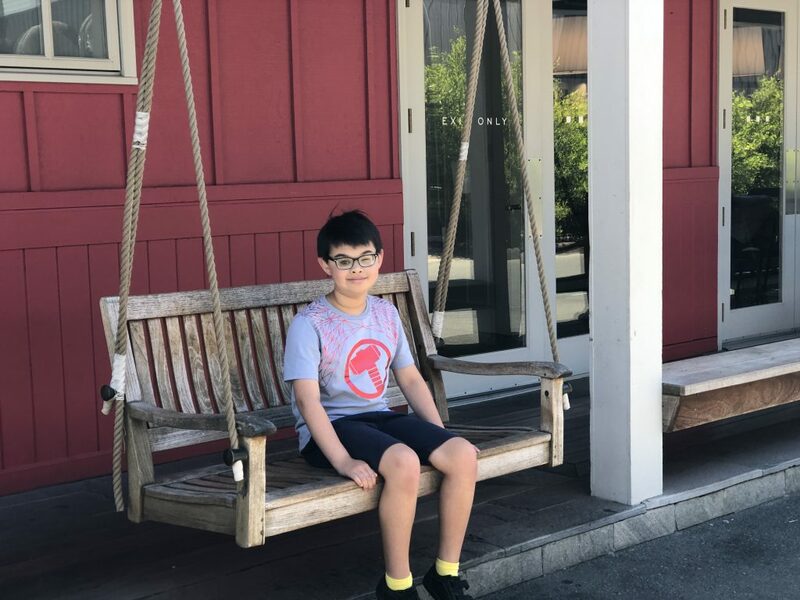 We would consistently tell him that this would be a very exciting adventure for him and that he would be meeting new friends and he is at the age when he should be experiencing away camp. Milo has several friends that are doing it for their first time this year and I think that got him really excited about doing it as well. One of the main reason we are sending him to an away camp because Milo needs to learn on being on his own and to do things for himself. Another big incentive is that this coming school year, his grade goes away for a week for Outdoor Ed. To ease Milo’s nervousness (and mine), I was able to arrange a quick visit of the camp site prior to his stay. 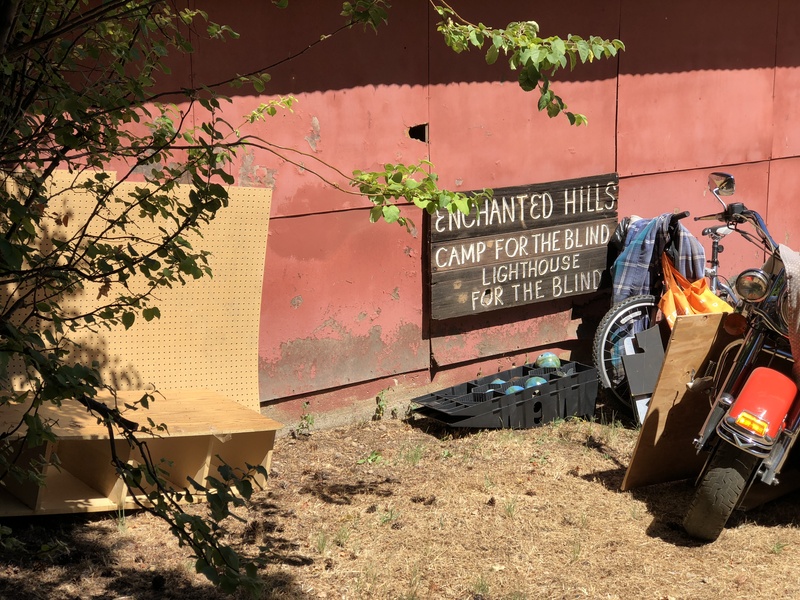 Due to the Napa fire last year, the cabins for the campers were destroyed along with some other facilities. EHC made some temporary tents for the campers and brought in some porta-potties (eek!). 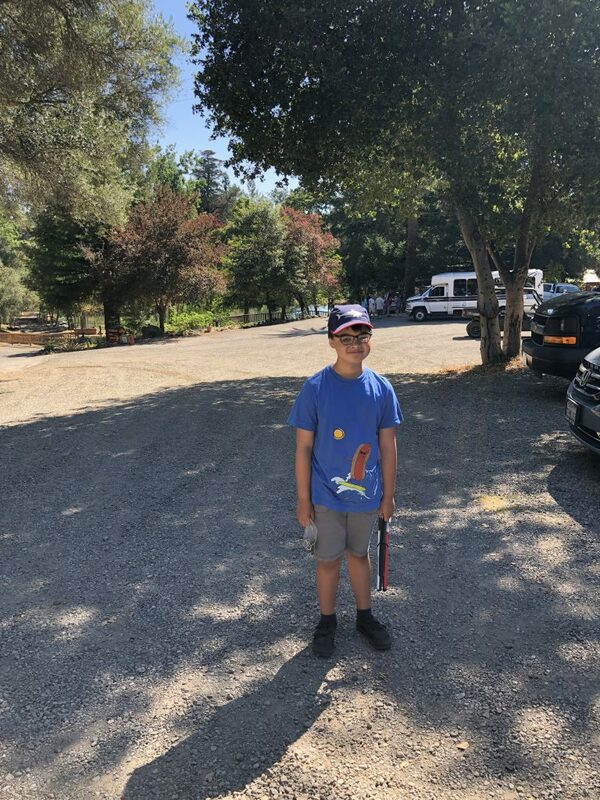 It was good that we were able to visit the camp site so that we know what we need to do to prepare and it eased both Milo and mine’s anxiety of what it will be like. I packed all of Milo’s belongings in clear 2 gallon bag so that he can see everything clearly. All the clothing that we packed are slightly stained or that he has almost outgrew so Milo doesn’t have to worry about getting them dirty or having to save them. I bought him a shower caddy to store all his bathroom related items (shampoo, lotion, toothbrush, washcloth, etc) so that he can just pick it up and go. I packed him some extra large garbage bags (for things he want to throw out) and a laundry mesh bag (for clothes he want to keep). Milo ended up throwing out all the clothing he wore so he pretty much came home with less stuff. 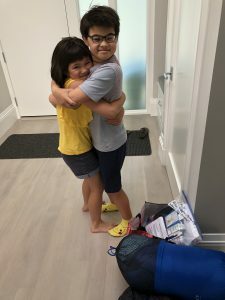 Matilda and Owen saying “goodbye, we love and will miss you so much” hug before Milo and I go off to camp. Milo and I having lunch before I drop him off at camp. Milo spent a week at camp. He was pretty nervous when I dropped him off that day and I pretty much kept thinking and wondered what he was doing all the time and paranoid that I would get a call from camp. We both made it through the week and he was a happy camper when we went to pick him up. Phew! Milo survived and so did I. Milo took a very long shower after we got him and with fingers crossed, we hope all the rebuilding will be done by next summer at EHC. Milo at pick up at Enchanted Hills Camp. I plan to send Milo back to EHC next year and I do wish Milo could go on an away camp with his peers in a non visual impaired camp. But as of this moment, I do not think it will work well for Milo since a lot of the away camps involved lots of activities that would not be good for Milo or be difficult due to his vision impairment. And one challenge that I think Milo would have is to navigate around the camp site especially in the evening and night time when everything is dark and having no aid to help him.